According to data cited by the New York Times, 45 percent of Coca-Cola sales come specifically from end-of-the-aisle racks. Because more people see products at the end of the aisles, therefore items like Coca-Cola end up being a default choice simply because they’re in plain sight. The same holds true for every area of our lives, including when it comes to our health and fitness. Every day of our lives we have the same type of default choices in our kitchens, in our offices, in our automobiles, and in our living rooms. And we also have them when we’re at the grocery store shopping for food. That’s why the ends of food aisles – i.e. “endcaps” –are key money-making machines for grocery stores. – If you sleep with your phone next to your bed, then checking social media and email as soon as you wake up is likely to be the default decision. – If you walk into your kitchen and there’s a bowl of candy or potato chips sitting there, you’re more than likely going to grab a handful and eat it by the time the day is over…. just by default. – If you always have beer in your fridge (and you like beer) then drinking beer more frequently is likely to be your default decision. Of course, defaults can be positive as well. – If you keep a water bottle with you throughout the day, then drinking water rather than soda is more likely to be the default decision. It is more difficult to eat healthy when your kitchen is filled with junk food. But if you go to the grocery store with a healthy list of foods to buy (after eating a hearty meal), you’re more than likely going to make the healthier choices. But if you decide to go to the gym or attend a high-intensity group fitness class instead, you’re no doubt going to have a great workout. These are choices we all make every day, just by default. 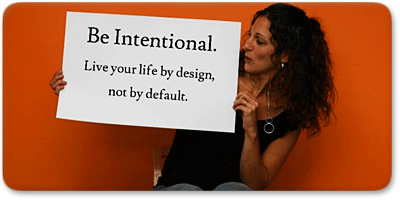 Learn to live your life by design—NOT default. If you consciously monitor the default decisions in your life, rather than accepting whatever is in front of you, then it will be MUCH easier to stay in shape and live a healthier life. Most of us have the freedom to make a wide range of choices at any given moment, so we often make those decisions based on the environment we find ourselves in… or we simply accept whatever is placed in front of us. If you want to live life with a lean, healthy body… you need to consider how your default choices could be hindering you from achieving your goals. Alter, tweak, and shift your environment until it matches what you want out of life. A very special thanks to my spiritual mentor, Lucciano Del Monte, and author James Clear for providing the inspiration for this message. How Do YOU Stay Motivated For Fat Loss? The #1 Tip for Building Amazing Bicep Peaks! Is YOUR Fat Loss S.M.A.R.T. ?